June 16 is the 167th day of the year(168th in leap years) in the Gregorian calendar. 198 days remain until the end of the year. 632 – Yazdegerd III ascends to the throne as king ( shah ) of the Persian Empire. He becomes the last ruler of the Sasanian dynasty (modern Iran). 1904 – Irish author James Joyce begins a relationship with Nora Barnacle and subsequently uses the date to set the actions for his novel Ulysses ; this date is now traditionally called "Bloomsday". Emperor Konoe was the 76th emperor of Japan, according to the traditional order of succession. Rorgon I or Rorico(n) I was the first Count of Maine and progenitor of the Rorgonid dynasty, which is named for him. He was Count of Rennes from 819 and of Maine from 832 until his death. Year 839 (DCCCXXXIX) was a common year starting on Wednesday of the Julian calendar. 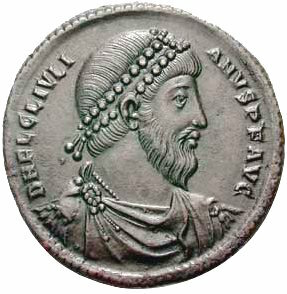 Aurelianus was Archbishop of Arles from 546 to 551. His predecessors were Auxanius and Caesarius of Arles. His father Sacerdos was an Archbishop of Lyon. His cousin Nicetius succeeded his father as Archbishop of Lyon. He died on 16 June 551 in Lyon and is buried in the Church of Saint-Nizier. The text of his epitaph is preserved. Aureus of Mainz is a Roman Catholic saint and the first named bishop of Mainz. His feast is on 16 June. Saint Benno was named Bishop of Meissen in 1066. Venerated since the 13th century, he was canonized in 1523. Bloomsday is a commemoration and celebration of the life of Irish writer James Joyce, observed annually in Dublin and elsewhere on 16 June, the day his novel Ulysses takes place in 1904, the date of his first outing with his wife-to-be, Nora Barnacle, and named after its protagonist Leopold Bloom. ↑ Åkerman (1 July 1991). Queen Christina of Sweden and her Circle: The Transformation of a Seventeenth-Century Philosophical Libertine. BRILL. p. 157. ISBN 978-90-04-24670-6. ↑ Gough, Barry M. "Tonquin". The Canadian Encyclopedia. Historica Canada . Retrieved 2018-09-06. ↑ "Anthropocene Metamorphosis of the Indus Delta and Lower Floodplain" (PDF). Retrieved 22 December 2015. ↑ Chisholm, Hugh, ed. (1911). "Tauler, Johann" . Encyclopædia Britannica . 26 (11th ed.). Cambridge University Press. ↑ Louis de Rouvroy Saint-Simon (duc de) (1959). The memoirs of Louis de Rouvroy, duc de Saint-Simon: covering the years 1691-1723. Heritage Press. ↑ G.E. Cokayne; with Vicary Gibbs, H.A. Doubleday, Geoffrey H. White, Duncan Warrand and Lord Howard de Walden, editors, The Complete Peerage of England, Scotland, Ireland, Great Britain and the United Kingdom, Extant, Extinct or Dormant, new ed., 13 volumes in 14 (1910-1959; reprint in 6 volumes, Gloucester, U.K.: Alan Sutton Publishing, 2000), volume II, page 82. Wikimedia Commons has media related to June 16 .